East led the 9 and declarer won with the king and played a spade to the jack, continuing with the king when it held. West took the ace and switched to the 9, continuing with the seven when it held. Declarer ruffed in dummy, cake to hand with a diamond and played the queen of spades and a spade to West’s ten. When she proved to have a third club that was one down. Here too East led the 9 and declarer won with the king and played a spade to the king. 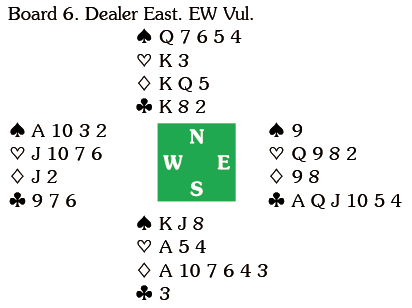 Taking East’s nine at face value she played three rounds of diamonds and West ruffed as East pitched the 10. West’s 9 was covered by the king and ace and declarer ruffed the club continuation and played a diamond. West ruffed with the 10 but declarer overruffed,ruffed a club and played a diamond for a beautifully played ten tricks and 10 IMPs. 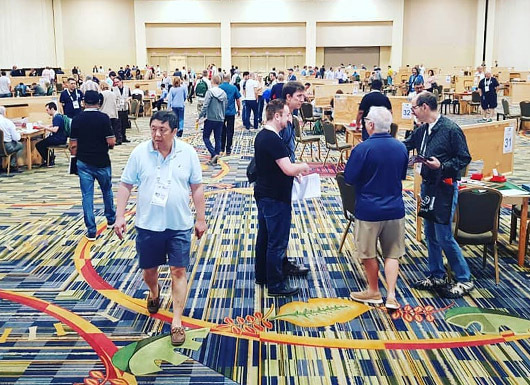 In the Rosenblum Gawrys went down by playing a second spade at trick two, while Bocchi was favoured by the lead of the A.